The result is a video that shows 5 Rube Goldberg reactions created in 5 different locations across the country. Each one “triggers” the one that follows. (I particularly liked the “Women in Stem” portion from New Hampshire.) The projects reflect major issues representative of the artists’ regions, so the video is probably best for older students who can discuss the message delivered by each one. The final segment of the video returns to its starting place, Oakland, and addresses the issue of excessive force used by police officers. Larry Ferlazzo recently published a post on his blog about a site called Word Sift. I decided to try it out with a text that I am reading to my 5th grade students, hoping to give it more meaning. We just finished reading The Giver together, and Lois Lowry’s Newbery Acceptance speech for the honor received by this book is included in my edition only. It is an amazing speech, and the students always become excited as the revelations are made that connect all of the pieces in the book to Lowry’s life. However, I am regularly seeking ways to add some more interactivity to this oral reading and discussion. This year, the students created mind maps with the book’s recurring themes (which we analyzed using LitCharts) as different nodes. They are adding the relevant examples from Lowry’s speech to the nodes as I read. Word Sift might add another layer to this analysis with its visual representations. I copied and pasted the text of Lowry’s speech into Word Sift to see the results. 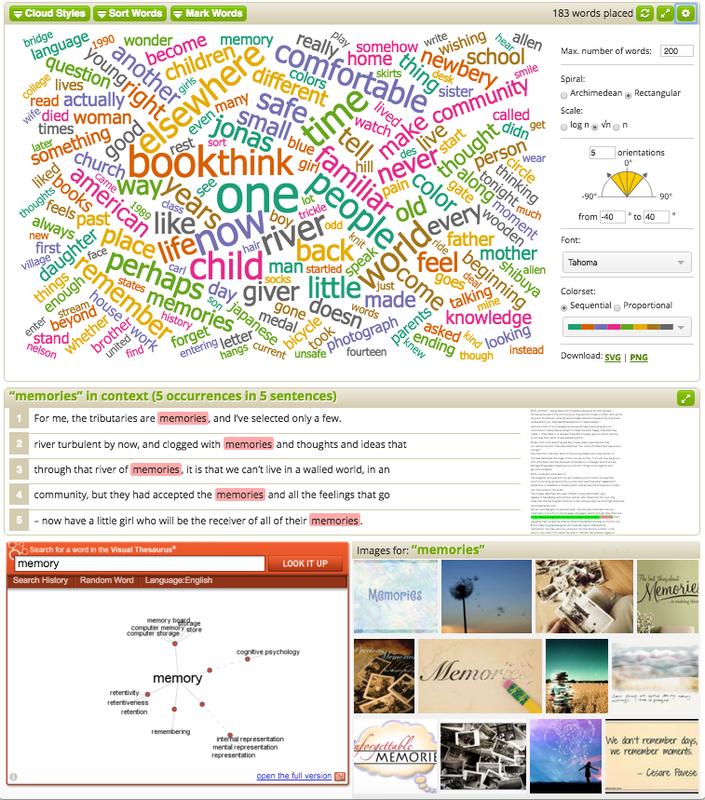 Word Sift will not only give you word clouds, which can be modified in several ways, but you can also select words from the cloud to see them in context and images from the web that represent them. There is also a connection to a visual thesaurus. With the word cloud, you can highlight certain vocabulary, such as Marzano & Pickering words from the 4 core subjects. You can also sort the words alphabetically or by how rare each word is in our language. This tool would certainly be an asset for ELL’s, but it is a great resource for anyone who would like to examine a text more deeply, and to learn more about the words used to compose it. 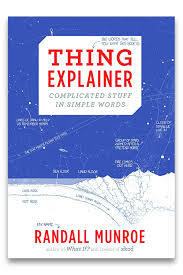 To my delight, I noticed on one of my “Lists That Can’t Be Missed,” that the author of The Kid Should See This, has recommended Munroe’s new book, Thing Explainer, as a great gift. I’m one of those geeky teachers who asks for things for her classroom as gifts, and my husband kindly indulged me by putting it under the tree. The book’s Table of Contents is called, “Things in this Book by Page.” Munroe is kind enough to put the more formal names of each explained thing underneath the titles, which you may find more necessary in some cases than others. For example, “Boat that goes under the sea,” is a submarine. Of course. What do you think “The pieces everything is made of,” refers to? Periodic table. Maybe you got that one, but I have a feeling that, “Shape checker” won’t come so easily to you. Included in the book is a nice poster of a “Sky Toucher” which I intend to laminate for my classroom. 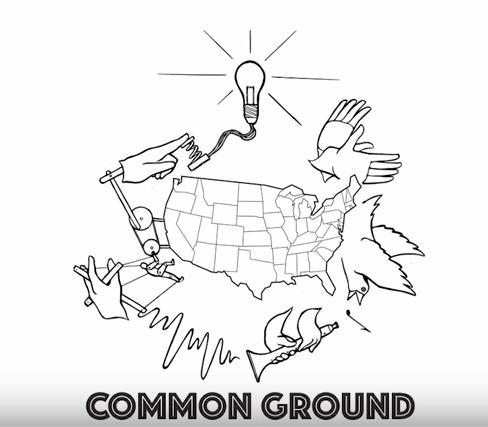 If you’re interested in other xkcd merchandise, here is a link to the store (which includes a poster of the Up Goer Five). 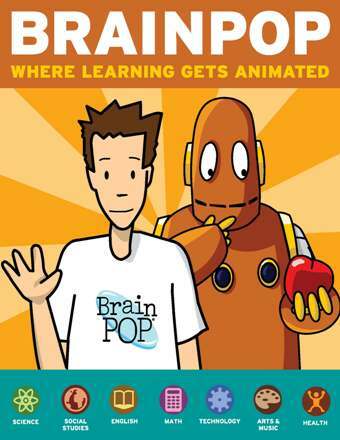 I haven’t shared a lot about Brainpop on this blog because most of its resources are based on purchasing a subscription. There is a free app with featured videos that can be viewed, though, and you can get a free 30-day trial. It also has a fabulous and free “GameUp” section which I have mentioned on this blog, and I still highly recommend it. The games tie very well into school curriculum. I think the subscription ($1200/yr. for school-wide access) is well worth it, and I rarely say that about subscriptions. If you can convince your school, district, or PTA to fund one, I think you will find that it is money well spent. There is a treasure trove of animated videos that are very engaging for kids, quizzes, accompanying worksheets and activities, and lesson plans for teachers. The reason I am mentioning all of this today, however, is that Brainpop has an exciting new feature, called My Brainpop, coming down the pipe later this year (in time for the 2013-2014 school year), which will allow you to really utilize it for differentiation. You will be able to add classes, track your students’ progress on quizzes and games, and even personalize your own quizzes. This is a huge benefit. Although it does not sound like they will be offering the ability to assign specific videos to different students, I am hoping this feature will be added in the future. If you have never tried Brainpop, I urge you to check out the free trial. And, if your school does have a full subscription, you might want to think about how you can use this new feature to your advantage during this upcoming school year! I love this idea from Maureen at StrongStart. Meant for primary grades, this activity could easily be differentiated for any ability level. Using file folders with a picture glued inside, and a hole cut on the exterior that shows part of the picture, students are asked to guess the picture. Hints can be given on the outside. Older students could easily design these folders themselves, photographing or even drawing the pictures on the inside. This could be tied in to any academic discipline to review or introduce terms, characters, and settings. Visit Maureen’s blog for ideas on how to implement this in your classroom. #3: Vocab Ahead – This site includes videos and a feature for teachers to create personalized lists and embed them on their websites or blogs. This site is primarily for upper level students, as it hits pretty hard on SAT vocabulary. #2: Word Sort – You have to figure out the secret rule for classifying the words. I love that this simple game involves logical reasoning, as well as building vocabulary. #1: VocabularySpelling City – This site allows teachers to build their own lists, offers lists that have already been created, and encourages practice on the students’ parts by playing a variety of games with the words.